Before I discuss my absence, I’d like to share something with you. If nothing else, to prove that I don’t need to make stuff up. Earlier in the week, we attended a pool party at one of Emme’s best friend’s house, to celebrate the successful end to Challenge A of Classical Conversations. And by successful, I mean that no students, tutor, or parents ended up on the news throughout the school year. That was something we all feel we needed to celebrate. Siblings were also invited to attend, so we had a nice variety of ages and interests. 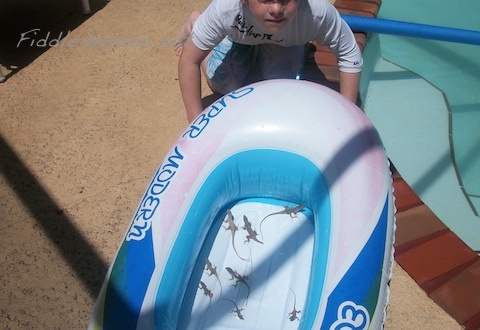 And since my son was involved in the mayhem, lizards became a focal point. Our friend’s pool was housed in a screen enclosure. With just enough compromised screening to make it the perfect lizard habitat. I reminded Jensen that his skin doctor had told him NO TOUCHING OF THE LIZARDS. And because I am an awesome parent, I did not hesitate to make a bee-line for him every time he cornered a lizard, loudly whispering tales of STAPH INFECTIONS, OOZING PUSTULES, and the like. At first he adhered by using pool noodles to capture his prey. Then he solicited the help of other younger siblings to do his bidding. In no time at all, somewhere in the neighborhood of 15 or so lizards were rounded up. But what to do with them? Please add us to your guest list the next time you plan a pool party. Now. Where have I been? I haven’t spoken about my battle with Lyme Disease in quite a while because I’ve felt that I had it under control. If there’s a remission for Chronic Lyme Disease, well then I would say that I’ve been there. However in the last couple of months or so I’ve noticed some physical issues changing. I’m experiencing a good deal of pain. Some times I can mask it with Tylenol, some times not. I’ve been off of antibiotics for about 18 months now, and have been managing most of my symptoms through homeopathic medication. But even that is not working. I had an appointment with my general physician this morning to go over some blood work. My Vitamin D is much lower, and my C4A (which is a marker for, among other things, chronic Lyme) is now up to 21,500. It should be down below 3,000. I’ve noticed it steadily rising over the last year. It’s time to head back over to Orlando to see my Lyme doctor. Who now has a huge business in Florida, as he is one of the few Lyme literate doctors in this state. In fact, his next available appointment was late in June. The staff knows me well, and they called me back within 30 minutes to give me a cancelled spot for Monday morning. I love those girls in the office. So, help is on the way. Often times in the last few years, as I’ve struggled with Lyme Disease, writing about the insanity that is my life with children has helped me to keep my focus where it belongs. Instead of the pity party that I’m most drawn to. But lately, writing has been a struggle. Not physically. But mentally. I know I will get through this, and will ultimately defeat this insidious disease. I’ve come so far already. I’ll try not to be so quiet. I think it’s my own personal character flaw that when I need to reach out to family, friends, community, I retreat. This is a character flaw that I know I share with a lot of women. Probably even a lot of you. I thank you all so much for your love, support, and prayers through this journey. I have such a wonderful support system and am so blessed. My husband would call this my Moment of Dread. You know, those few stolen moments when you sit very still, summoning up the strength to face a really difficult task. Like mopping the floors. Or scraping yogurt off the ceiling. Or fighting Lyme Disease. Onward and upward. Have a fantastically blessed weekend, my friends. Praying, friend…can’t wait to see you in JUST 2 WEEKS! We shall party by the pool! ((((Dee Dee))))) I am keeping you in praying. I’m praying for healing, comfort, and for God’s strength for you. Please don’t retreat ( I do the same thing), but let us know how you are and how we can specifically pray for you and your family through this. God bless you. Praying and believing for your complete healing my beautiful friend. I also tend to isolate myself when I am struggling as well. I think the enemy loves nothing more than to make us feel alone. Glad you are reaching out and I will continue to pray for your strength, healing and peace. Please write! I really enjoy your insights as a very ‘keeping it real’ kind of mom…but mostly I would like to hear about your battle with Lyme. I am “celebrating” one year of dealing with Lyme this month. I know what you mean about mentally preparing to face the hard task. Thanks for sharing so honestly, it is encouraging to me. I can relate with you on the drawing away – I do it so much I all it “the turtle”. I tend to draw back and draw in when faced with adversity or illness. I’ve been “turtled” on and off for years now. I just don’t feel like inflicting myself on others – my pain, my complaints, my needs and my tears. I try to remember that when I am in pain, I don’t need to be a pain to others. My heart goes out to you. Praying for you, my friend… Praying God’s healing presence and power. Praying that He will encourage you and do a mighty work. Oh my dear girl, I am so sorry you’re going through this. You are being prayed for. You have summed up my last two years. I am starting to realize my Point of No Return came when Cedars denied Sarah as a donor for such a stupid reason. In many ways, I still am. Have you seen the blog lately? Yeah. I am praying for ylu ,my sweet friend. It is ok not to be public about these thi gs. Simetime, we need it to get back on our feet. In a matter of speaking. I also share that lovely character trait 😉 I’m headed to the beach for my quiet time tonight and I will be praying for you my friend! Thanks so much for always bringing a little more joy to my days through your blog. Praying that the doctor can help you. I’m so sorry that this has gotten you down but we all love you and pray for the best. You beat this thing back once, you can do it again. And if you’re going to have a pity party – invite me! I’ll bring snacks! Granted, it could make you sick because you like to eat healthy, but chances are rather high that I would make you laugh until you launched your drink out of your mouth and/or nose. 😉 Praying for you!